Watch out for that . . . Tree! Reaper and I had a nice day shark diving with Stephanie's company, North Shore Shark Encounters. We were with Rob Sporrer and a few of his friends. We saw lots of Sandbars and a couple big Galapagos - one was 9 feet!! After diving, our first thought was, "what's flyable?" as it was our last day to fly before Mr. President visits the island. 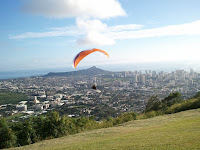 Reaper made some calls, and found out that Tantalus was working, and everyone was top landing and having great flights. We rushed over there to find that Alex was getting low, but he was able to scratch his way back up to land on launch. Mad Dog landed right after him. Jorge landed on the road below, so we knew it was starting to shut off. I thought I would be okay since I was trying out the new Ozone Swift, and I am a little light in it. 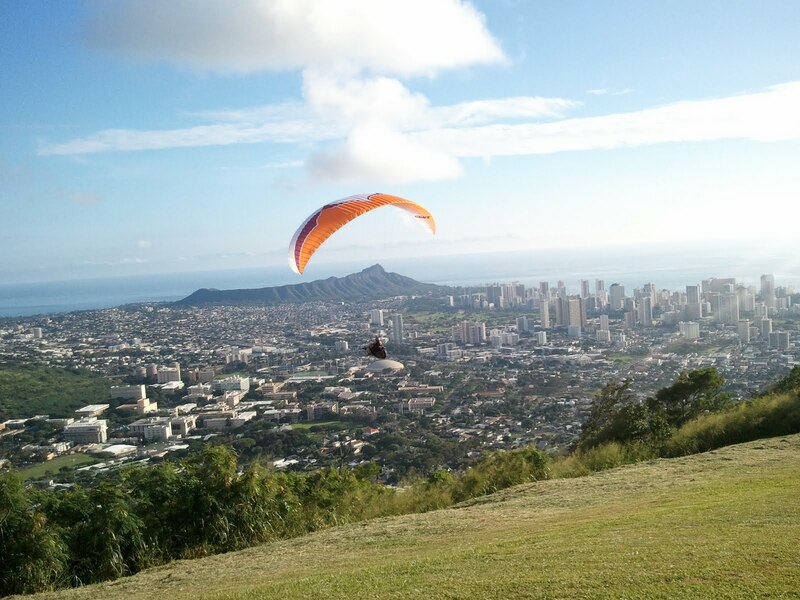 It was my first flight at Tantalus. I had a perfect launch, and felt great in the wing. I was getting up above launch, and worked my way up and down the ridge a couple times. As I went back towards the bowl, I hit massive sink, then found a little lift, and Reaper told me to turn into it. Without really thinking, I really turned into it - and I was too close to the ridge to turn all the way around. As soon as I straightened it out, I saw a dead tree coming closer and closer. I put my feet out, thinking I could just hit it really hard, and knock it down (hoping to fly through it). Well, I did, but there were a few other trees after that, and the next thing I knew, I was on the ground and my wing was in the tree. I quickly announced, "I'm okay. I'm okay." on the radio. Reaper called the fire alarm bureau number to let them know that a pilot's wing was in the trees, and that she is okay and on the ground, and we would get the wing out of the trees shortly. I looked around and noticed that the spot I decided to land in (ha ha) wasn't that bad after all - errr … not as bad as it could have been. The trees were dead and were easy to break, but the grass was about 6 feet tall, and it was difficult to climb up the slope. It took a lot longer for my rescue team to find me than I thought it would. I was yelling for them and blowing my whistle, and they couldn't figure out if I was closer to the road, or the park. It turns out I was only about 30 feet below the park! So Alex and Reaper came to my rescue, and we were out of there in no time, with only a scratch on my leg! Thanks for the assistance with the rescue, boys. And to Frank, Jorge and Ginny as well. Luckily, Reaper captured it on video!! I know you wanted to try that wing but of all our launch sites this one is the trickiest with no true bomb out LZ other than the road and even Fireman Dave missed that the other day and visited some cactus below the road. Your definitely using up the lucky bag, hey a few more Sidehills and you can have that name too!!!! Your launch looked great and now you got TAN off your list. Thanks for the right up and the vid.